Major indexes little changed amid light news and economic data. Small caps outpaced large caps for fifth straight session (Russell 2000 +0.4%). S&P 500 Index +0.1%, Dow unchanged, Nasdaq +0.3%. Trading volumes below recent averages, market breadth negative on NYSE, Nasdaq. Financials, energy lagged; offset by gains in technology, healthcare–which was boosted by biotechnology. Treasuries ticked higher with 10-year yield -1 basis point (0.01%) to 2.16%. Commodities: COMEX gold +1.3% to $1315/oz., helped by dollar weakness; WTI crude oil tumbled 2.4% on Hurricane Harvey impact while refined products spiked; copper jumped but other industrial metals mixed. Manufacturing data came in strong, U.S. trade gap widened (details below). Asian markets lower following North Korea missile launch. Nikkei, KOSPI (-0.2%). Reaction in Europe much sharper, perhaps because European investors had more time to react to news. STOXX Europe 600 -1.2%, DAX -1.7%. Euro above $1.20, highest level since early 2015. Safe haven assets rallying. 10-year Treasury yield down to 2.10%, gold +1.0% to $1324/oz. U.S. equities opened -0.5%; President Trump issued statement saying “all options are on the table” regarding North Korea. Today’s economic calendar includes Case Shiller Home Prices Index (consensus expectations +5.8% year over year), Conference Board’s Consumer Confidence Index. North Korea, Hurricane Harvey will likely continue to dominate news cycles. The North Korean missile launch over Japan superseded all other events globally overnight. Markets are displaying renewed concerns, but nothing close to panic. The markets closest to North Korea, geographically and otherwise (Japan and South Korea), are actually showing the least response, suggesting the market participants continue to believe that there will be some peaceful resolution to the issue, at least in the short term. U.S. Treasury bonds were stable. Despite higher yields (lower prices) early in the week, the U.S Treasury 10-year bond rallied back from a 2.22% on Tuesday, to a 2.17% on the week, just 3 basis points (0.03%) away from the year-to-date low yield of 2.14% reached in June. Year to date, the U.S. 10-year Treasury is lower in yield by 0.28%. The 30-year bond finished the week at a 2.75% yield, lower by 0.03% from the beginning of the week. The 2-year Treasury yield rose 0.02% on the week, underperforming the longer maturities. Inflation expectations fell slightly. Last week saw lower inflation expectations as measured by the 10-year breakeven inflation rate falling from a 1.77% to 1.75%, according to Federal Reserve (Fed) Economic Data. This is lower than the year to date average of 1.89%. The yield curve was flatter on the week. The 2’s to 10’s slope, a measure of the steepness of the yield curve, was flatter by 0.02% to 82 basis points (0.82%). The 2’s to 30’s yield slope was flatter on the week by 0.05% to 140 basis points (1.40%). International bond prices were slightly lower in Germany. The German bund 10-year yield was higher on the week, moving from 0.38% to 0.41%. This brings the spread between the U.S. 10-year Treasury and the comparable German bund to 170 basis points (0.41% vs. 2.11%). 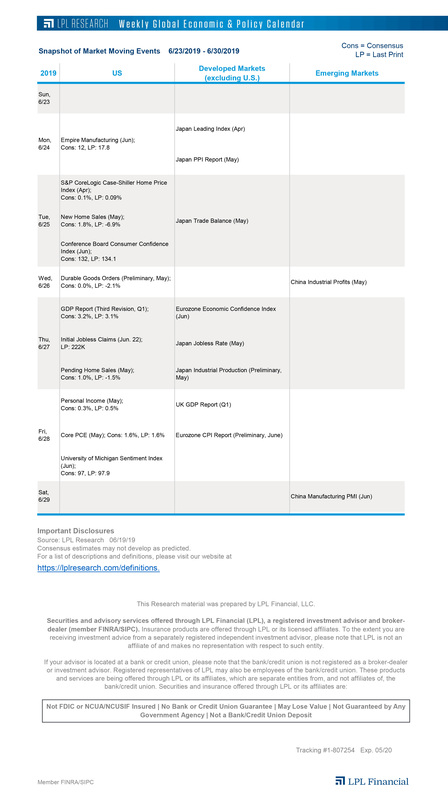 Economic data was light yesterday with just international trade, inventories, and the Dallas Fed Manufacturing Survey. International trade showed a slight widening of the trade gap in July, as exports fell 1.3% compared to a 0.3% decline for imports. Following gains in June, which helped give a late push to Q2 gross domestic product, wholesale inventories rose 0.4%, helping offset a 0.2% fall in retail inventories in July. The Dallas Fed Manufacturing Index came in at 17, which was at the high end of estimates. The details were also solid, with a notable 26.9 for wages and benefits which may point to some signs of wage inflation. Empire State and Richmond Fed indexes showed some strength in east coast regions, though it hasn’t yet flowed through to the broader national reports yet. The slow grind continues. The S&P 500 managed to gain 0.7% last week, ending a two-week losing streak. But this marked the 50th consecutive week the index didn’t close down 2% or more. Going back in history, this is the longest streak without a 2% weekly drop since 61 consecutive weeks in the mid-1990s, yet another sign that the action we’ve seen over the past year is a historical anomaly. Today on the LPL Research blog we take a look at what this means and what might happen next.